An eligible commuting equipment can save people time and providing comfortable riding experience. Airwheel foldable smart e bike will turn daily commuting into an efficient and joyous trip. Most people think that vehicles are merely facility to take them to different places. But eligible commuting equipment can provide far better commuting experience than ordinary ones. Depending on different commuting purposes, Airwheel, an established intelligent vehicle manufacturer has a multitude products to offer. People can find the most desirable Airwheel vehicles according to their own demands. In the modern society, people are seeking faster vehicles, from bikes to cars, in a bid to keep pace with the fast living tempo. But as more motor vehicles roam in the streets, the congestion has dramatically lowered the traffic efficiency. Though people have faster and more expensive cars, they still have to wait. 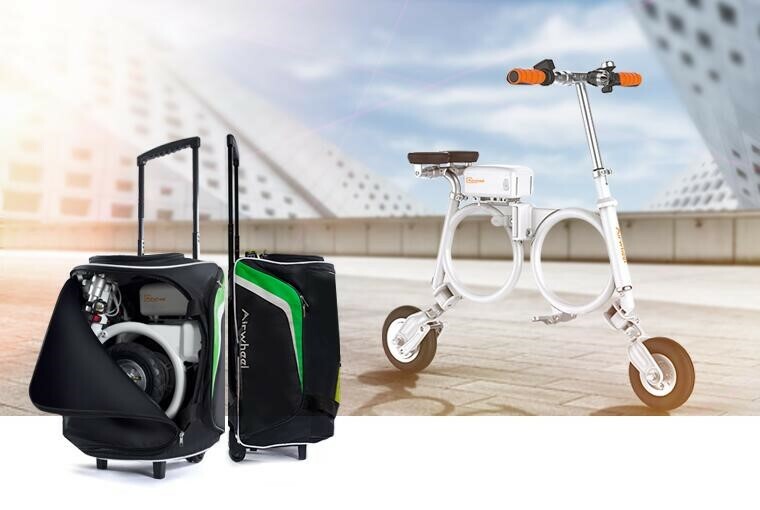 For those who are efficiency-oriented, Airwheel backpack e bike E3 is the best choice. E3 has a mini stature fit for both indoor and outdoor use. It weighs 12.5 kg and can be stored in a backpack when fully folded. E3 has successfully filled the gap of short distance commuting. The vehicle is agile enough to run on bicycle lane. To cover the distance between home and subway station, E3 will save people much time and labor during peak hours. To serve outing purposes, Airwheel get more to offer. Airwheel 2-wheeled electric scooter S8 is highly recommended. The vehicle has integrated a lot of fun into commuting. S8 is an intelligent vehicle which differentiates from traditional ones. It is operated by people’s body movement. S8 supports two ways of operation mode, sitting and standing. The vehicle is both a recreational and fitness equipment. When people go on a self-driving trip, the self-balancing scooter can be stored in car trunks. People can take them out for a ride at the destination, either to enjoy the scenery or to work out. S8 is adjustable to provide comfortable riding experience to people with different heights. As long as people wish to get around, they can always find the most suitable Airwheel device to serve their different purposes. With an Airwheel electric scooter or foldable e bike, commuting is no longer a boring experience.